MIF is associated with the development of metabolic dysfunction in first-episode schizophrenia patients following olanzapine treatment. Sixty first-episode patients with schizophrenia were studied for (A) BMI, (B) insulin, (C) triglyceride (TG), (D) glucose, and (F) plasma MIF before and after olanzapine monotherapy. HOMA-IR scores (E) were determined on the basis of plasma insulin and glucose values. 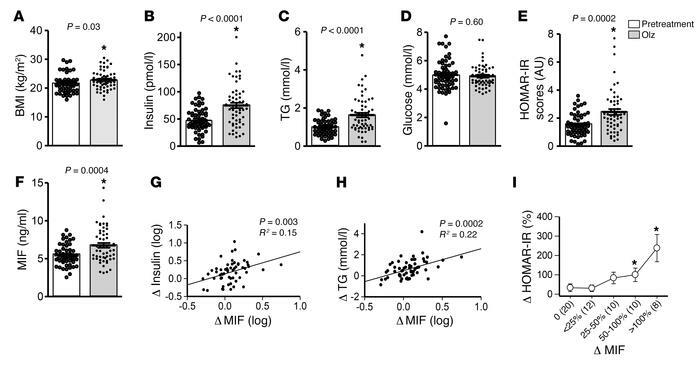 The changes in MIF correlated with alterations in insulin (G), TG (H), and HOMA-IR scores (I) following olanzapine. Student’s t test (A–F), Pearson correlation (G, H), and 1-way ANOVA plus Tukey’s test (I) were used for data analysis. All t tests were 2-tailed. Mean ± SD. *P < 0.05 versus pretreatment.